Shoes aside, picking the best running socks for your feet is probably one of the most important bits of kit that you can buy. 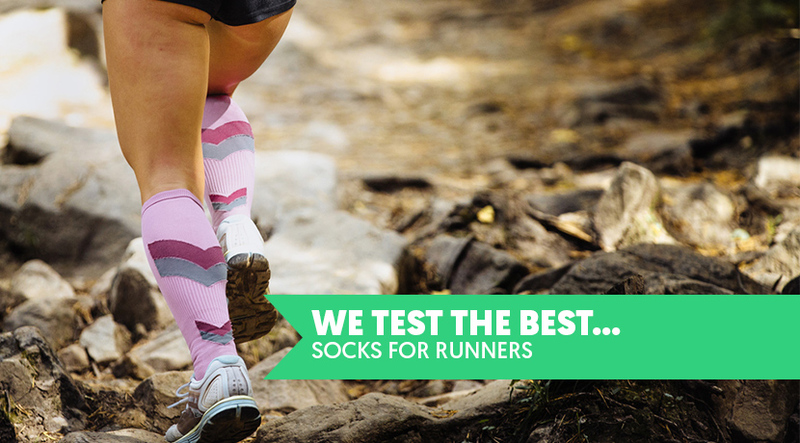 The right socks will make running a complete pleasure, however, run in the wrong pair and your feet will soon become uncomfortable and even develop blisters! See, we told you socks were important! We seriously can’t speak highly enough about the ASICS Kayano. If you’re at all familiar with the Kayano series of shoes, any sock that’s part of that range has got a lot to live up to. 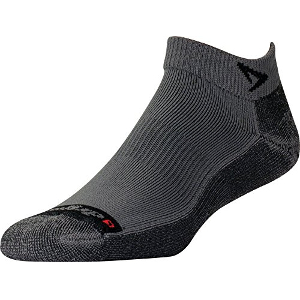 Firstly, the design of this sock is outstanding – the arch band provides just enough support to feel comfortable, yet gives enough pressure so that you know that it’s supporting your foot. Next up, the seamless construction means that there are no hotspots anywhere on your foot, reducing the chance of rubbing and blisters. Finally, the Y heel fit has been engineered not to slip when putting your shoes on or taking them off. The fit runs true to size and we can confirm that these really are one of the more comfortable pairs of socks on the market. 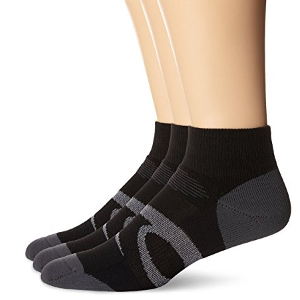 Made from a Polyester/Spandex blend, these no-show socks with pull-on heel tab are ideal for those summer evening runs. The Saucony Classics feel great to run in, the design of the socks is fantastic, they are extremely breathable thanks to the upper ventilation panel while the elasticated ankle cuff helps keep your foot in place. As a bonus, the ankle tab provides great padding for those running shoes with stiffer heals. The lower sole of the sock is slightly thicker than the breathable upper which offers a little extra padding. Arch support is good and held my foot in place throughout my run. 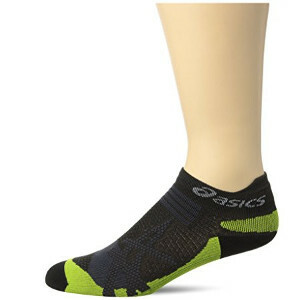 The ASICS Quick Lyte Cushion Single Tab Socks are made from a lightweight Nylon, Polyester and Spandex mix. 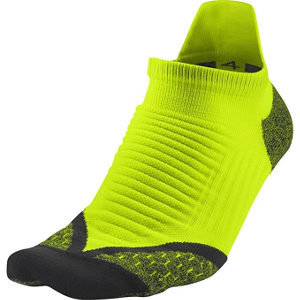 The end result is an athletic sock that is incredibly lightweight, breathable and comes with incredible moisture management. The toe is seamless which helps reduce rubbing and blisters. Arch support is good, although we’ve heard from some runners that they found it to be a little tighter than some of the other socks on test. When it comes to wicking sweat away and keeping your foot cool then you certainly can’t ignore the new Nike Elite Cushioned Increased Visibility Running Socks. Made from a Nylon/Polyester/Spandex blend these socks feel fantastic to run in. The color range is awesome – say goodbye to boring gray, black and white and hello to Volt, Turquoise and Spring Leaf. 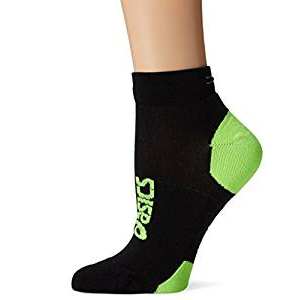 What we particularly like about these socks is that while the heel tab provides great protection for your achiliese and heel the footstrike zonal cushioning adds an extra layer of cushioning where you need it most. If you’re looking for a sock that’ll offer protection mile after mile then you’ll certainly want to take a closer look at the new Nike Elite Running Cushion Quarter Socks. The cushioning and protection is fantastic thanks in part to the strategically placed padding and sweat is wicked away with ease thanks to the dry fit material. 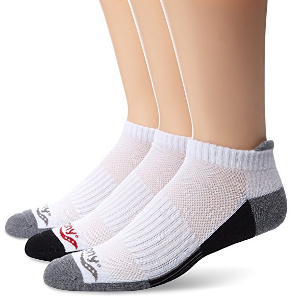 Made from a Polyester/Nylon/Spandex blend, these quarter socks are ideal for running. As you’d expect from Asics, thought has gone into making these socks ‘runner friendly’. For example, Asics have made sure that the Intensity toe are has a seamless design – helping to eliminate blisters, while the “Y” heel gore fit helps to keep the sock in place even when running technical trail descents. What we particularly like about the ASICS Intensity is just how well the wick sweat away from the skin – these are without a doubt the best socks for running. The extra padding in the toe and heel is fantastic while the elastic around the arch provides just enough support without feeling restrictive. The other big test of a good athletic sock is how well they wash – even after a dozen washes the ASICS Intensity still fit well and didn’t lose any elasticity. A favorite of many in the Authority Running offices, the ASICS Lite-Show Nimbus is an extremely supportive running sock that offers fantastic ankle and heel protection. If you’ve ever suffered from foot hot spots then the ASICS Nimbus could be the answer to your prayers. Extremely light, the Nimbus Low socks offer a good level of breathability and provide a secure fit even after a number of washes. Drymax have a long history of producing fine running socks and we’re pleased to report that their latest sock, the Lite Trail Run Mini continues this tradition. 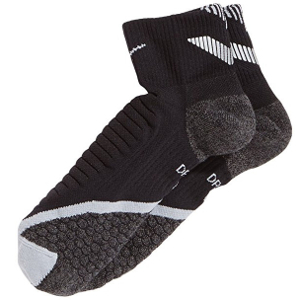 This could be the trail running sock that you’ve been dreaming of. Vents have been omitted to help keep the dirt on the outside rather than letting it through only to rub and irritate your skin. The extra padding around the ankle cuff not only adds a little extra comfort but it also helps to ‘seal’ the sock to stop trail debris from getting inside. Running my normal trail test route involves some splashing through a creek and I was pleasantly surprised to find that the Drymax actually kept my foot nice and dry. While I doubt it would offer much protection for prolonged periods of your foot being submerged, it did well for light exposure.